AcryShield® Quick Set roof coating products are specifically formulated to resist early wash-off associated with light rain and heavy dew weather conditions. The full line of AcryShield Quick Set base coat and top coat products can be applied directly over BUR, Mod Bit, Asphalt, Hypalon, EDPM, TPO, PVC, Metals, SPF, and Concrete for a brand new roof substrate. By applying the coating system over your existing roof, you eliminate time consuming removal stages and tear-off fees, allowing for a quick installation using environmentally friendly, sustainable roofing products. AcryShield Quick Set base and top coats allow contractors to have peace-of-mind when conditions like heavy dew and light rain are forecast soon after initial application has begun. Download our QuickSet Brochure for more information on saving time and costs with our fast setting roof coating products. 10 year old failing PVC membrane. Numerous cracks and badly crazed. Provide a sustainable roofing system with excellent adhesion and resistance to plasticizer, (a key component in PVC roofing membranes that prevents cracking) migration. Seamless, energy efficient roofing system featuring a fully adhered, leak free 120 mil membrane. Evening installation with heavy dew that deposited on the roof during the evening was completed using AcryShield Quick Set roof coating. 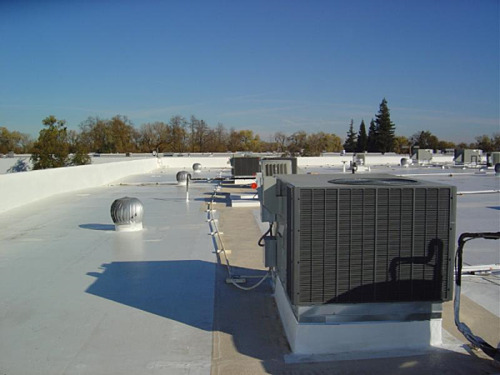 Costly recover or tear-off was not required; repairs and coating were completed at only a fraction of the cost of a recover roof. 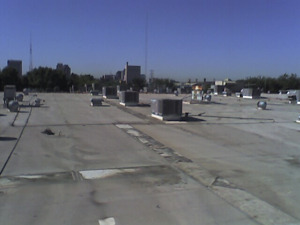 With their new National Coatings AcryPly Cool Roof System, California Lottery Commission has restored a severely leaking PVC roof, avoided spending a substantial amount of money on a tear off and gained energy efficiency by reducing air conditioning costs and the production of greenhouse gases. 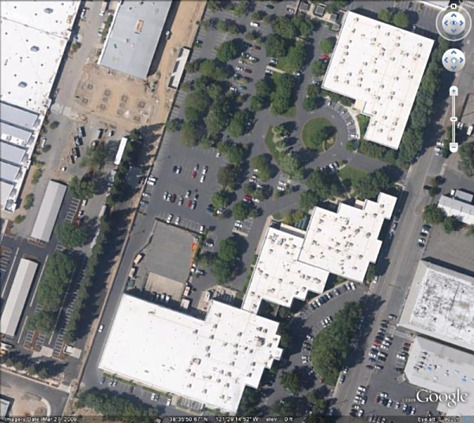 "The collaboration for the project with National Coatings was very helpful along the way. The change to the Quick Set product was accomplished on the fly an was a seamless effort due to the intimate association during the life cycle of the project. (Would not have been successful otherwise as the timing was at the very end of the season)." 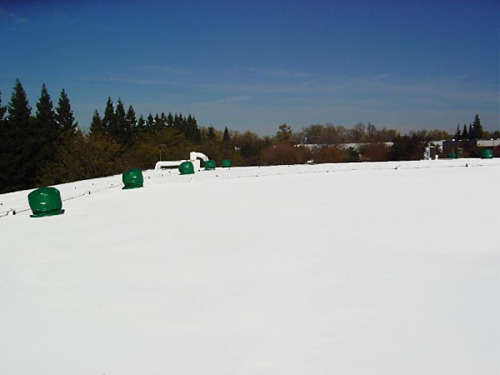 Can Roof Coating Systems be Installed During Wintertime? 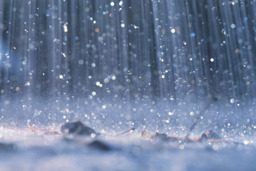 Always check weather conditions before application and never apply if rain is anticipated within 24 to 48 hours. Air temperatures should be at a minimum of 55˚F with temperatures expected to rise for the following 24 hours. This includes temperatures during nighttime. Apply the roof coating system in the early morning, finishing early into the afternoon to allow for a minimum of four hours of sunlight for the coating or sealants to cure. Areas such as California, Hawaii, Texas, Arizona and Florida often have warm winter temperatures averaging between 60˚F to 90˚F in January. As long as these temperatures do not drop below 55˚F during the evening and rain is not expected, these weather conditions are acceptable for installing a roof coating system during the winter. Base and top coats need 8 to 24 hours to dry completely (this is dependent on weather conditions). No roof coating systems shall be applied if weather will not permit it to dry prior to exposure to precipitation or freezing. Dew and fog can interfere with and damage coatings from properly curing. Coatings must be stored between 40˚F – 90˚F. 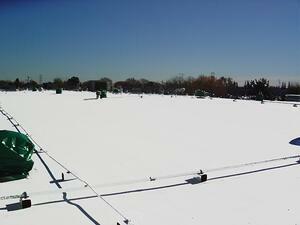 Do not leave coatings or sealants on the rooftop if temperatures are expected to drop below 45˚F. National Coatings has a full line of Quick Set roof coatings that are uniquely formulated to allow you to work in the "shoulder" season. The AcryShield Quick Set base and topcoats sets up rapidly and provide assurance to building owners and contractors that no early wash-off associated with heavy dew and light rain will occur. These coatings can be applied on virtually any roofing substrate including: Asphalt, BUR, Mod Bit, Concrete, Single-Plies, Hypalon, EPDM, TPO, PVC, and Metal. Don’t let light rain and heavy dew stop you! Download our Free Quick Set Brochure Today!